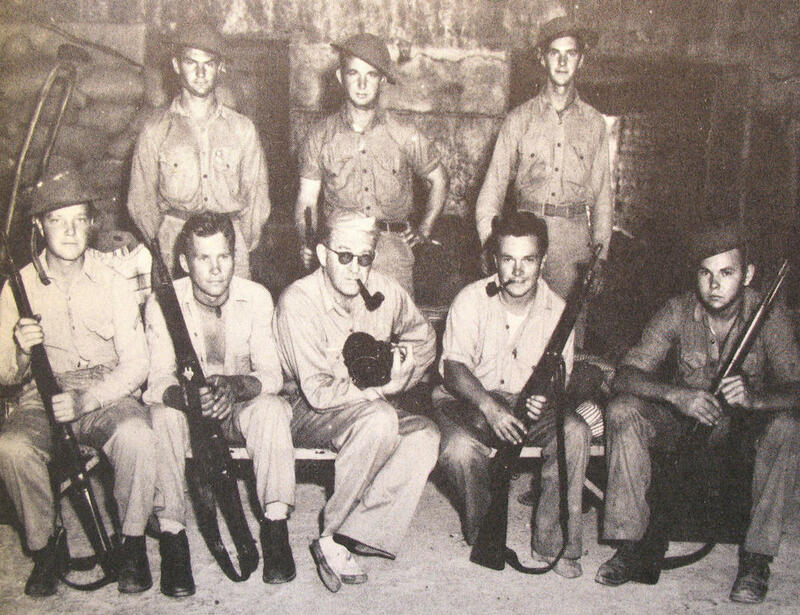 Searchlight crew with movie producer John Ford (center) in Midway power house. PFC Drake is standing at left. Don Drake was a Marine with the 6th Defense Battalion during the BOM. His searchlight crew enjoyed the company of movie producer John Ford for two weeks, and it is from Drake that we learn much of what Ford’s actual experiences were during the battle. He earned college degrees in business and law after the war, returning to the service as a Navy JAG officer. He retired in 1974 and became an administrative law judge after a few years in private practice. In addition to Drake, Roundtable member John Miniclier appears in the above photo at Ford’s left. Miniclier retired from the Marine Corps as a colonel.